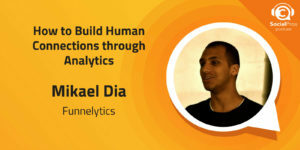 Mikael Dia, CEO and Founder of Funnelytics, joins the Social Pros Podcast to discuss meaningful analytics and data that builds a loyal community. The ad, the sponsored Facebook post, the free download, the blog—the list goes on and on of content businesses constantly create and put out into the world, and it’s all working towards the same goal: sales. The time, effort, and money that your business is putting into various marketing avenues needs to count for something. There’s a wealth of data for you to gather and analyze, but it’s also easy to look at the numbers and lose sight of your real goal as a business. It’s important to never forget that your customers are people—individuals—and that they are on a journey when interacting with you. Your analytics shouldn’t stop with things like first click attributions and simple numbers. When you put the effort into understanding your customer’s personal journey through tools like Funnelytics, you start to see which parts of your advertising are truly working for you. Why it is often difficult for businesses to break down which advertising efforts are working. Why first/last click attributions are not effective measurements. How to use Funnelytics to optimize your funnel. What separates a good business from someone just selling a product. 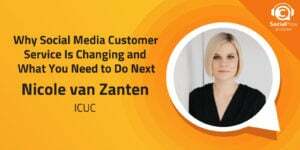 How to connect with your customers while providing business value. The only thing that matters is creating an impact! As a massive basketball fan, Mikael would love to speak with LeBron James about how he has been able to carry on such a successful career for so long! Adam Brown: Welcome to Social Pros, the podcast for real people doing real social work. This is Adam Brown, Executive Strategist of Salesforce Marketing Cloud. Unfortunately Jay Baer, our esteemed leader, could not join us today. But he missed out on a fantastic discussion with Mikael Dia, CEO and Founder of Funnelytics. Now, Funnelytics is an interesting, fascinating program, and service and technology that allows people and marketers and communicators and agency folks to be able to really track the performance of their programs. We always talk about funnels and journeys and how you want to cast your net wide, but then you want to continue to make that nest, and that net smaller, and smaller. What Mikael has created with Funnelytics.io enables that, and it's a really powerful story. But Funnelytics is only half the story. Mikael is a serial entrepreneur, and really has an interesting story on how he approaches life, how he approaches being an entrepreneur, how he approaches actually leaving a very good job in the agency world, and venturing out to create his own company, and become the leader of it. I hope you will enjoy this show. I certainly did, and for Jay Baer, this is Social Pros. Welcome to Social Pros, the podcast for real people doing real social work. I am as always, Adam Brown, Executive Strategist for Salesforce Marketing Cloud. Could not be happier to be here. I am sadly not accompanied by our sincere and [inaudible 00:01:44] of Jay Baer. Jay is out giving a speech somewhere spectacular, but he is missing out, because today we get the opportunity to talk to a really interesting person with a really interesting organization. Mikael Dia is CEO and Founder of Funnelytics. Did I say that right, Mikael? Funnelytics? Mikael Dia: Funnelytics, that's right. Adam Brown: Funnelytics is a fantastic concept and I'm really looking forward to all of our listeners, to be able to hear a little bit about it, and what I want to do today is talk, one, about how Mikael and his team at Funnelytics are using social media to market this service, and I encourage you all to go to Funnelytics.io to check it out. But secondly, I also want to talk about Funnelytics as a product and as a service that we at Social Pros, as marketers, as communicators, can use to help us monitor and manage the ROI and all those important things that we're tasked and responsible for, for being able to measure the success of not just our social programs, but the big picture of overall marketing programs. Mikael, so great to have you on the show. Mikael Dia: Oh, thank you for having me. This is going to be a lot of fun. I'm super excited to be here. Adam Brown: I hope so. Let's start out from the basics. Tell everyone what Funnelytics is. Mikael Dia: Okay. Funnelytics, I mean the concept I'll share a little bit of backstory, because I think it's important. But I've been building online businesses for a long time and everything that I use or my marketing methodology has always been around funnels and marketing funnels, and trying to convert paid advertising or any sort of traffic into profit, right? That's what we try to do as marketers, and a lot of times what we do is we sit in front of a whiteboard or a notepad or something, and we draw out our marketing funnels with lines and arrows, and squares, and we say, "Okay, well Facebook going to a landing page, and then that landing page goes to an opt-in page, and then there's email follow-ups, and you just draw all this out on this whiteboard. Then you have to go and build it, using something like ClickFunnels or whatever landing page software you use. Then after that, you hope that you can figure out how to use Google Analytics, and all of these different analytics tools to track and measure what you drew on your whiteboard. Back in I think this was back in 2013 that I actually had the idea. I started developing it in 2016, but my idea was always, "Wouldn't it be really, really amazing if I could just draw out my marketing campaign on a software, on a canvas, on my computer, just like I would on my whiteboard, but then hit a little switch and see how people are flowing through all of these pages, these steps, these ads, these emails, right there on that same canvas?" Sure enough, after building countless of funnels for my clients and for myself, I got frustrated and I decided, "I'm just going to hire a developer and let's start building this tool, and let's see where it goes." That's kind of the basic. It allows you to map your funnel on a canvas, and then you can hit a little switch, and you can visually see how people are converting through each step of your funnels, of your campaigns. Adam Brown: I think one of the funny things about this whole concept, and Mikael, I've often times talked about this on the Social Pros podcast, is John Wanamaker, who was the Founder of Wanamaker's Department Store, early 1900s. I think he was attributed with the phrase, "I know I waste half my advertising. I just don't know which half." That was in 1908, and her we are in 2018, and we're still dealing with that. That half is getting smaller now, but it's still about the funnel, starting and casting that net wide, and then trying to find that person or persons who's most likely apt and receptive to purchase your product or service. Mikael Dia: Yep, and the biggest problem, though, is just like you said, I don't know which half is making me money or not. It's because right now, to really understand your marketing, you kind of have to be a data scientist. You have to love looking at spreadsheets, and charts, and graphs, and compiling all of this stuff together to really trace things back. Because you can't just look at your Facebook or your analytics and maybe I'm one of the few, but I don't think so. Most people are visual, and they don't like to look at charts. They don't like to look at spreadsheets and try to decipher them as if they're in The Matrix. They want to be able to visually see like, "Oh, that's what's working. Oh, this isn't working, so I'm going to stop doing that." But it's really hard using just numbers and math. That's what I was always trying to solve with Funnelytics. Adam Brown: ROI I think to any company, I don't care if you're in the services organizations, if you're large or small, you are tasked with doing two things. I've always said, when you have to go in front of your CEO, he or she is really going to be interested in only one of two things. "Are you making me money, or are you saving me money?" And saving money from marketing is cost avoidance and operational efficiency and things like that, but the most ... That's easier to be able to articulate. The "Are you making me money?" is so much harder. I think we've gotten so much better, but we're still in that wall of last click attribution and things like that, and especially in the social space, it's harder and harder for us to be able to show that attribution. Talk a little bit about how, not just a data scientist, but a more layperson "marketer/communicator" can go into Funnelytics and be able to set up some funnels and to set up some metrics that can start to bring actionable insights. Not only to show their CEO, "Hey, this is working" but secondly, if I know that something is counterworking, I'm probably going to want to do more of that in my next program. Mikael Dia: Yeah, and here's the funny thing. Everything that you mentioned about last click attribution, first click attribution, I always found that extremely strange. Because we're measuring people based on clicks, and based on they're just integers, but that's not the reality. These are actual people who go through a specific journey to get to your checkout, or to fill out an application to work with you, or whatever your end goal may be. You can't just go and say, "Well, actually, the first click or the last click is what ended up making me my money or my ROI." It's about the entire path. It's about where did they first start on that journey? What did they do next? How many days was the lag time in between? 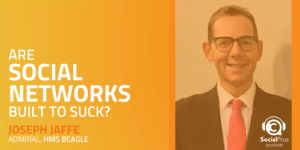 Unless you can visually map that entire path that they took, then it becomes really hard to say that, "Okay well, if I just have this one retargeting ad, or this one Facebook post, that's the reason why they became a customer." Well, no. Not necessarily. They may have seen your page first, and then were reminded by it with your Facebook post, and then they read a blog post, and then they opened up an email, and then they ended up converting, but it was a combination of all of those things. The biggest difference and the biggest reason why Funnelytics works so well is because it is absolutely meant to be visual. It's your canvas. You map the path that you want people to take and then you actually go and see, "Are people taking that path?" If not, what path are they taking in order to get to that endpoint? You can map that entire thing. You can visually see it over a course of time, or a specific snapshot, and whatnot. You can map your social posts, anything that you post on Twitter, on Facebook. You can track all of those links, but you can also trace it back to ... Because ultimately what we're doing is tracking people and those people take specific actions at specific times, over the course of time. It makes a massive, massive difference when you're able to visually see. When you can go back to your CEO and say, "Hey, this right here, if we keep pushing this path right here, and people keep taking these steps, we're going to keep making money." That's very powerful, right? That's how you go to your CEO and say, "Here's how I make you money." Adam Brown: I'm going to assume there's probably a couple of different main phases of using Funnelytics. First, certainly you've got to establish what that plan is, as you've articulated, Mikael. But then you have the data that actually gets flown in or flows into that funnel. Is that something that the user does manually? Or, do you associate and tie into Google Analytics or your Facebook data or something like that? How does that whole process work to keep the data inside of Funnelytics live? Mikael Dia: In simple terms, we have one little pixel that you install, just like you would install a Facebook pixel onto the header of all of your pages, and wherever you actually people can land on your pages, it's that one pixel that is a little script that you install. We have a lot of tutorials in terms of how to use it in all of the different types of platforms, but then we do tie back to the actual CRM, so whatever autoresponder you use, or your Facebook ads or your Google ads. Now, currently we are in our analytics side, we are in beta, so we're still adding more integrations, we're still adding a lot of really cool functionality to make it better, but actually, one of the things that you just mentioned, it is in phases, right? The first phase is absolutely mapping. You have to map what all of your assets, all of your marketing pieces, onto the canvas. The second phase is actually yes, just installing that one code and then Funnelytics starts gathering all of this data and displaying it to you on this map, on this canvas. The third phase that we're going to go into, which we're not there yet, but as a company where we want to head, is now that you have all of this data, what do you do with it? How do you optimize? How do you pinpoint what's working, what's not? How do you actually continuously optimize and try to improve those metrics over time? That moves us into the optimization phase, running split tests, and being able to visually see, "How can I optimize each part of my funnel or each part of my marketing campaigns right then and there on that same canvas?" That's the iteration, the process we're taking our customers through as you map, then you go and you track, or analyze, and then you optimize. That cycle keeps moving forward, and then you continuously improve over time. Adam Brown: Mikael, I'm assuming that you have a lot of different customers who come to you from a lot of different marketing or communications disciplines. You may have some PR folks, you may have some web people, especially on the commerce side with merchandising and just the actual commerce folks, and social folks. 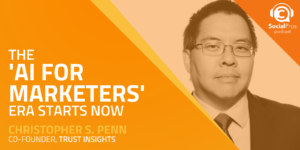 I'm curious if you're seeing an increase in social practitioners using your tool, and if their needs, their needs for showing ROI, or the way that they approach measurement, is different than other marketers, communicators, and audiences. Adam Brown: Practitioners for their own brand? Mikael Dia: Yes, practitioners for their own brand. The vast majority do campaigns for their clients, right? They want to track and figure out what's happening. The way that Funnelytics at its core, works, is through link clicks. Somebody clicks on a link, whether that link is in a Facebook ad or in a Facebook post, in a group, on Twitter, in a banner ad, doesn't really matter. Once that person clicks that link and they come onto your website, now that's where the magic starts happening and starts tracing it back. The minute that person clicks a link, we can start to see what that person does from there on out. We can start tracking it. Whether you're using it for social purposes, or you're using it to measure your paid advertisment ROI, it's the same as long as somebody clicks on a link that sends you to your website, or to your clients' websites or whatnot. Adam Brown: Okay, so now the cobbler's kids going barefoot question. Here you are, a creator of a great marketing tool that is used by all these advertising, marketing, media agencies, as well as practitioners, how are you using Funnelytics to help market your product, and specifically how are you using Funnelytics to measure some of the social activities that you're using to drive people to Funnelytics.io, to try out the product? Mikael Dia: I think there's two interesting questions there, and maybe I'm jumping ahead and you had this question lined up afterwards, but there's how I'm using social in order to grow Funnelytics, and then how I'm using Funnelytics to measure my growth of Funnelytics. Adam Brown: Good unwrapping of the questions, yes. That's perfect. Mikael Dia: Okay. Let's start with how I'm using social to grow Funnelytics, and then I'll talk about how I'm using Funnelytics to measure the growth of Funnelytics afterwards. Funnelytics is a new tool. We launched in December of 2017, so not very long ago. We just opened up our doors, and the funny thing is, I actually, when I originally was developing the software, it really was for myself. It was for my agency, and my clients, and I really wanted to build this tool for myself. Adam Brown: The freemium model. Mikael Dia: Yeah. Most people right now in the SaaS world go the free trial. 14 days, you still have to put in your credit card, but after 14 days you, then it moves onto a rolling plan. There are the freemium models, which is where you have like the free tier, and then you also have paid options as well. You can use the product for free forever, to a certain degree, and then it moves on to the paid options. When I originally was about to launch this product, I wanted to go down the, "It's only paid, but you get the free trial." But after a little while, I was hanging out with a couple very smart entrepreneurs, I was showing them the software, and to me Funnelytics has always been an analytics tool, right? The backbone has always been about analytics, and I was showing them this mapping tool, and I was showing them how you can go and map your funnels, and then you can analyze them, and they're like, all these guys were sitting together and they were looking at my computer screen, they're like, "Mikael, this mapping tool's really cool." I was like, "Yeah, I know it's really cool, but it's about the analytics tool, guys. That's what the whole purpose of this software is for." They're like, "Yeah, but the mapping tool is really sweet." I'm like, "Okay, so what?" They're like, "Look Mikael, I think you should go about this by giving out this tool for free, to the market, make it free forever, and ultimately if people map their funnels and they actually go and build it, logically they'll want to track it. They'll just naturally ascend to your paid version." 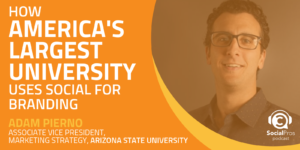 After hanging out with these guys, I was like, "That's a really pretty smart idea, and it makes sense, especially 'cause there's very few mapping tools out there to map your marketing campaigns." Most people use PowerPoint and stuff like that, right? This is very easy, drag and drop. That's what I did. In December of last year, I opened up the free tool. By this point, the actual analytics side was still very much in development. I was using it a little bit here and there for my own purposes, but there were a lot of bugs, a lot of things that we were tweaking. So as we continued to develop the analytics tool, I gave myself two months before I would open up the doors, for the paid analytics tool. Seeing as I actually, there wasn't anything much I could do, 'cause I'm not a developer, on the actual development side of things, I spent the entire two months focusing on building a community and giving insane amounts of value to that community, in return for nothing. Adam Brown: And to that point, Mikael, did you assume that these were going to be agency folks? Did you assume they were going to be more brand marketers? Or you weren't even sure at that time? Mikael Dia: I wasn't fully sure. I mean, I was using it myself for my own clients, and for my own businesses, too, though. I have a nutrition business and as I was running my agency, I wanted to use it for my own agency, but then also for my clients. So, I assumed it would be for people who would do it for their clients more so, but I wasn't 100% sure. I just advertised it as a free mapping tool for your marketing funnels. People just started signing up and whatnot. Now, the first thing that happened was yeah, as soon as people joined the Facebook group, I focused on six core posts. Six core post types inside of my Facebook group, to give value. Something I learned from Russell Brunson is about developing your attractive character. One of the biggest problems that I find in especially the software space, is people think that their product is so good that they don't have to have a leader in front of the company, that their software does all the talking for them, and that people are going to stay loyal and whatnot. They don't build a community, they don't build a culture around, a tribe around the software. They don't show people the vision of where they're trying to help them get to, right? As marketers, our core job is very simple, is to identify our dream customer, and figure out what is the mountaintop that they really want to achieve, they really want to reach? Our goal is to help them get there. Whatever that mountaintop is that we're defining for them. Every single step that you develop or create in order to help them get there, that's where your offers come in. That's your solutions. If you position your entire business around your product or your service, you end up forgetting your customer, and that mountaintop. But if you start thinking about that mountaintop, now you can start thinking about all of the different value, all of the different products, all of the different services, all of the different things that you can do to help them get there. Now you actually become a business and not just a person selling an individual product. Adam Brown: I think that's so important and I think we sometimes forget that. As marketers and as communicators, sometimes we don't do the best job of marketing and communicating. We don't practice sometimes what we preach, and remembering when you do have a product like Funnelytics, and you have a user like you said, maybe it's a data scientist, or a social media practitioner at an agency, or an account, what's in it for them? What's in it for them is, "Let's talk about maybe" ... It's about them getting promoted and getting a better job. It's getting to be a director or a VP or an SVP in that agency or organization. How are they going to do that? Well, they're going to have to kill at showing how successful their programs are, that means they win that Cannes Lions, they win that ADDY, they win that Clio and things like that for showing of measurement. What you're talking about and what you are trying to do in your first couple of steps with your Facebook strategy is identify those people and then find out what was meaningful to them? Mikael Dia: Exactly. And then, as I started surveying them, that's when I started realizing, "Okay, what kind of value are they looking for?" A lot of people, like I said, were solopreneurs or one to three man agency teams, servicing clients. Smaller sized businesses. A lot of their problems were very much around acquiring more clients, and getting a consistent flow of clients coming into their business so that they could service them and whatnot. Part of what I was sharing and part of what I was providing was, again, thinking about that mountaintop. If that's where they're trying to go, well cool, Funnelytics is a tool that's going to help them get there, but they need a lot more than just this mapping tool. Adam Brown: The tool's not going to do it all for them. Mikael Dia: Exactly. So, I provided trainings, I provided a lot of tangible value, PDFs, actual downloadables, stuff like 20 minute, 30 minute trainings with PowerPoints. It takes a lot of time and I created content. I actually gave them real value, but it's not enough, right? So a lot of times people just try and share pure value, pure content, but here's the reality. People want to connect. That's the reason they're on social in the first place. That's the reason why they're hanging out on the Facebook group. They're not just there to gain all of this value. They want to connect with you, right? A lot of what I was doing as well was sharing business lessons through my journeys. My journey as an entrepreneur, and stuff that I've gone through, but turning those stories into actual lessons and the things I took away from those particular experiences or epiphanies or whatnot, in order for them to connect with me, in order for them to realize that there's actually a leader behind this company, there's actually somebody who has a vision and wants to take this business and this market to another level. That made them bond with me, right? That made them really see a lot of connection between themselves and me, and it made them want to follow me. It made them want to see what else I was posting. If all you're doing is posting value and you're not sharing anything about you in terms of your personality or lessons or your philosophy, or even lifestyle, showcasing the way you live. Sometimes I would post a picture of my daughter inside of this Facebook group, because she was marking ... I had funnels on my whiteboard, and she was just scribbling, so I was like, "Look, future funneler over here." Things like that makes people feel like they're following somebody who's actually real, human, right? Adam Brown: Why do you think so many brands don't understand that? I applaud what you're doing, in a couple of different levels. Number one, this is the storytelling that Jay and I often talk about. If you're 9 times out of 10 just talking about your product and your product feats and strengths and attributes, I mean, everybody's going to turn you off. You're hoping then, next to those cases, that your posts actually get seen. The second is you've got to find that humanistic side. I'm curious, A, why do you think so many brands don't get this? And number two, being completely honest, did you think it was going to go this way when you were initially creating the Facebook group and creating the posts? Or did you go in there and go, "Listen, interesting, these are small and medium business owners, these are smaller agencies, I have an opportunity to mention the entrepreneurial side and talking about that, talking about some work/life balance and some interesting topics, because I know I can emulate or work with them." I'm just curious what your thought process, and when you had this epiphany. Mikael Dia: For your first question, why don't people do it? I don't know why people don't do it, actually. I think it's silly that people don't. I think they really need to. If you look at any big company in the world, there's always some sort of attractive character on the front of it, right? That attractive character doesn't always have to be the CEO or the leader of the company, but there's always something that humanizes the company. Because the reality is people don't trust companies. They don't trust brands. They trust the person. Adam Brown: Not like they used to, yeah. Adam Brown: That aspirational marketing. Adam Brown: I like the purple lights. Mikael Dia: Yeah, exactly. I like his ... Same thing with Elon Musk. I mean, how many electric cars are there? Lots. He's not the only one trying to build electric cars, yet here ... I mean, he's not doing a very good job on the financial side of things, in terms of production and whatnot, but it doesn't matter. People follow him, because they want to be like Elon. Adam Brown: He's created a tribe, just like you mentioned earlier. Mikael Dia: Exactly. You have to understand that, and even when ... Look, this is a horrible example, because the person himself is not a good person, but it's the perfect example, when you look at Subway, and you look at Jared and this person who lost a whole lot of weight, supposedly eating only Subway sandwiches. Well, now all of a sudden there was a human element to this company, this sandwich shop, where there's an attractive character that people resonate with. "Hey, I want to lose a lot of weight." Now look at that, right? Now all of a sudden, people started gravitating towards going to Subway, and started seeing it as a weight loss business or company and whatnot. Adam Brown: ... and the association between Jared and Subway that made it that much more of a crisis when the terrible news about Jared's background came to light, and he was tried and convicted. That made the brand that much more, sadly, or in this case, we're glad everything happened, but it was a terrible blow for the Subway brand. Mikael Dia: And like you say, now you look at it and there's both ways. You always have to keep in mind that you're taking that person to the top of the mountain, right? And at the top of the mountain needs to be that attractive character who's shouting out to the marketplace saying, "Hey, you've got to come to the top of this mountain." That's any type of business. I mean, look at McDonald's, right? Who's McDonald's' dream customer? It's certainly not the adult. It's the kids. And who's the attractive character? Well, guess what? Its Ronald McDonald and all of the other cartoons and characters that they have. Why? Because McDonald's is meant to be fun. That's why they have happy meals. You come to McDonald's, now because McDonald's has been around for so long, we grew up with it as children, we used to love going there, getting our happy meals and getting the little toys, and now it's ingrained in our memory that we have to go to McDonald's. But it was always about having that attractive character sitting at the top saying, "Hey, if you want to have fun, if you want to eat really good food and eat good burgers, but you want to have fun doing it, you've got to come to McDonald's," right? That's what people wanted. They didn't really care about the burgers. You could go and get burgers anywhere. It's about the actual mountain and who you're trying to target as your dream customer. If you don't have that attractive character in place, you remove all human aspect of your business. Adam Brown: Sure. So much of Funnelytics is you, and your identity and how you created this. I love the story that you shared with us before we got started, in terms of how you came about becoming the Founder and CEO of Funnelytics, and you had a great job in an agency, and just said, "You know what? This is not my future in terms of work/life balance and being part of my family." You had an epiphany on a vacation. I would love for you to share with our listeners a little bit about that. Mikael Dia: I started my agency at the very end of 2014, really beginning of 2015, and I was very driven at the very beginning of the agency. Because I was so excited about helping my clients. I was so excited about the customer service side of things, but I was also very excited about scaling and growing this agency, right? I'll be completely honest, a lot of the reason why I decided to do a done-for-you service style agency, where we actually build your pages and your marketing campaigns, is because I was hanging out at a mastermind a couple of years back, and they drew this pyramid where at the top of the pyramid had the three $ signs, and it's like, "If you want to make the most money, you do done-for-you services." The second tier was, "If you want to make a little bit less, but still a decent amount, you do done-with-you services." Coaching, that kind of stuff. "And if you want the lowest, you show people how to do it themselves." I was like, "I want the most money, so I'm going to do that." That was being completely honest, my mindset. I was extremely excited about working with clients and helping them and the first 18 months of our business, although we were doing extremely well on the service side of our business, when we were getting clients we were really hands-on and it was exciting, we were getting them incredible results. Our actually lead acquisition and getting customers was very difficult. We did okay, we probably did about 200,000 or so in revenue in those first 18 months, but we were testing a whole bunch of different funnels. I was teaching people how to set up their funnels, and I was actually building marketing funnels for our clients, yet I couldn't figure out what funnel I had to implement for my business, in order to generate a consistent flow of customers. We tried webinars, and we tried trainings, and we tried giving away these lead magnets, and these free content guides, and all sorts of different things. Eventually after about 18 months, we finally figured it out. We finally figured out the exact funnel that would work very well for our services. Almost overnight, just boom. Skyrocketed. Our leads started flying in, our calendar was booked, we were closing sales consistently. I think we went from, we probably did 20 grand or so the previous month, and then we went right up, 60, 80, 100, 160. We hovered between like 100 and 160,000 for several months. But now came another problem. We were growing this fast for sales, but our operations was not keeping pace. The best analogy or the best way I can explain is like on the operation side, you're building a conveyor belt, right? You're thinking of it like a Ford plant, and you're building this conveyor belt, but you're putting people on the conveyor belt, as you're building it. People are moving through the conveyor belt and boom, they fall off the front. You're like, "Ah crap, I've got to keep building, keep building," right? And then another person falls because you're loading up that conveyor belt too quickly. In February of last year, we were doing extremely well in terms of revenue. I thought our operations was in a good spot. We had nine full time employees and I decided to take a vacation with my wife. We decided to go to San Diego for two weeks. My daughter was just born recently. She was about five months old at the time, and it was our first vacation in a long time. My wife as pregnant, and all of this, and I was working so hard on the business that we were like, "I deserve this. We're doing so well, we're generating a lot of money. I've got a team now. Surely everything's going to go well. We're going to take a vacation." We go to San Diego, and I kid you not, the entire two weeks that we were there, my wife and our little daughter spent every single day walking up and down the beach by themselves. Just alone, while I was on calls, doing email, Skype calls, clients were calling me up saying, "I hired you because I wanted to work with you." My team was calling me asking me, "How do I handle this?" Or, "How do I do that?" and whatnot. It was hell, to be honest. Here I was, trying to have the first vacation with my family, and even when I was sitting at dinner, you could sense the stress oozing out of me. It wasn't even enjoyable and at night, I would lay awake just thinking about all of the stuff I have to do the next day. It just didn't end, and at the end of the vacation, my wife said to me, she said, "Mikael, I respect everything that you've done and it's great, but I wish we didn't take this trip." I was like, "Huh." Mikael Dia: Yeah, that's a punch in the face, but at the same time, I kind of did wish we didn't either, because we just ended up spending a whole bunch of money and not enjoying ourselves, and we were miserable. But it also made me realize, that trip made me realize that something needed to change, right? The work/life balance, as entrepreneurs, we get to create our own paths. That's the reason why we become entrepreneurs, is because we want to create our own paths. Here I was, I created a path that didn't make me happy. I was unhappy with everything, so I had to make a choice. The first thing is, I decided to right away, as soon as I got back, like, "Okay, we're not adding any more people onto this conveyor belt. That's for sure." We cut off all of our lead generation, everything was turned off, and when you have a marketing funnel, the funny thing is once you get it to work, it works. It literally is like an on/off switch. You turn it on, and it starts working, you turn it off, it's like nothing comes anymore. It's like it's over. There's no organic evergreen type of stuff just coming. It's like on and off. Then I spent the next six months working through, I had to let go a bunch of my employees which is probably the hardest thing to do. People dedicate their time, and their livelihood to you. After about four months, I had to make a decision, 'cause really, we were burning a lot of money, and no more clients were coming in, and I had to make a decision. "Where am I going with this? Am I turning it back on or am I going a different direction?" After evaluating it, I decided that it wasn't for me. The future, I could envision what the future was going to hold, and that's not the future I wanted. Adam Brown: The future was Funnelytics. Mikael Dia: The future was Funnelytics, exactly. 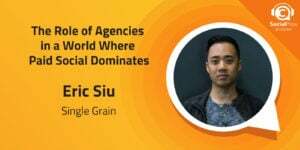 The funny thing is, as I was growing my agency, when we were hitting our peak and we were making a good amount of money, I was reinvesting a lot of those profits into developers for Funnelytics. Because I just thought that this was going to be a tool that would save me a lot of time and a lot of headaches, and a lot of effort. Turns out I was right, it is a really great tool, but it actually now became my focus and became the business that I decided to focus my attention on. Adam Brown: I love the story, and I think this is helpful for all of our listeners who everybody probably has a little bit of an entrepreneurial gene in them, and to hear the story of your success and then the challenge of having to pivot and change directions, and take a very, very sizable risk in doing that, and then having the success that you've had right now, I think is really something that's of interest to a lot of our audience. 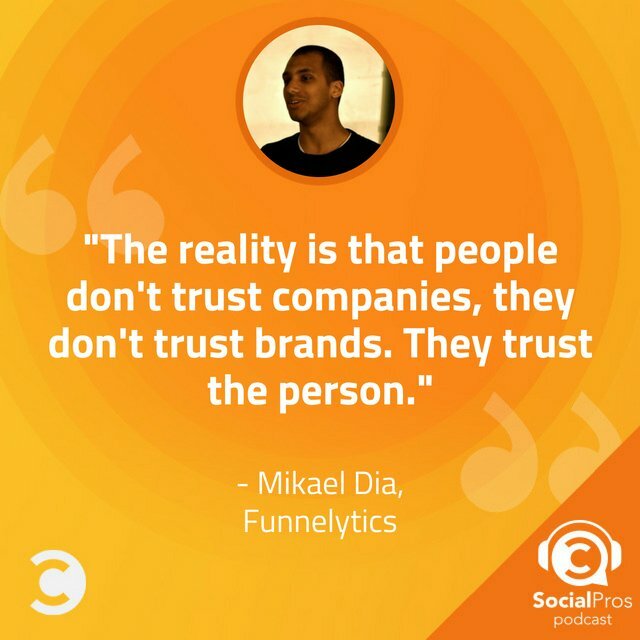 Mikael Dia, CEO/Founder of Funnelytics, great to have you on the Social Pros podcast. I'm now going to ask you the two questions that all 300 and something guests on the show over the past five years have answered. Mikael, are you ready? Adam Brown: First question is, what is the one tip you would give someone who wants to be a social pro? Mikael Dia: Focus on creating impact. Focus on impacting the person that you're trying to speak to. That's all that matters. If you can change their life or if you have a mission to get them to the top of their mountain, you will become a social pro. Adam Brown: Yeah. That's great insights, and I think we can probably even unwrap that if we had a little bit more time. Question two, final question, Mikael Dia. If you could have a Skype call with any living person, who would it be and why? Mikael Dia: Right now, man. Adam Brown: I tell you, you've already mentioned most of the people that are at the top of the list. When I was a guest on the show, gosh, I think four years ago, before I was even a co-host, Sir Richard Branson was mine. Elon Musk has been mentioned many times. Who's it going to be for you, though? Mikael Dia: Man, so many. But actually right now, it would have to be Lebron James. Mikael Dia: That's who I would want to speak to. Because of who he is as an athlete, being 15 years in his NBA career, still playing at the level that he's at, the mindset that he has to have to be at that peak for that long, and I'm a massive basketball fan. So, that would probably be just today, that would be the person I'd want to just chat with and get an insight of how somebody like that, how their mind works. I'd be very curious. Adam Brown: Yeah. From an entrepreneurial standpoint, from an athletic standpoint, from a leadership standpoint, yeah, he checks a lot of those boxes. I like Lebron James. I think that's a good answer. Mikael, thank you again for being on the show. For listeners, thank you for being our listeners. Jay and I feel honored and humbled to join you every week and hope you are subscribing to our shows, and again, we hope that you email us if you have any questions or thoughts, or would like to be a guest on the show. But for Jay Baer, the aforementioned leader of our show, I am Adam Brown from Salesforce Marketing Cloud, and this has been Social Pros.